Legumes have long been a primary source of sustenance and protein in the global diet. This tremendously large family of vegetables includes fresh and dried peas and beans as well as lentils, alfalfa, carob and peanuts. Because they’re nutritionally comparable and often interchangeable in recipes, dried legumes are generally set apart by their appearance – lentils are shaped like discs, beans are kidney-shaped and peas are round. Although they’re available whole, dried green peas are commonly sold split. You’ll get about 115 calories from 1/2 cup of split dried green peas, according to the U.S. Department of Agriculture. Right around 70 percent of the calories in dried peas – or about 21 grams for a 1/2-cup serving – come from carbohydrates. Although dried peas do contain a small amount of sugar, most of their carbohydrates are the complex variety that take longer to digest and contribute to long-term satiety. Protein accounts for almost 30 percent of the calories in dried peas, which equates to about 8 grams per 1/2 cup. Like other legumes, dried peas contain very little fat – a 1/2-cup serving has less than half a gram. Legumes are among the best sources of dietary fiber available, and dried green peas are no exception. According to the U.S. Department of Agriculture, a 1/2-cup serving of the split variety supplies about 8 grams of fiber, or 33 percent of the recommended daily value. Because they’re rich in soluble fiber, eating dried peas can help you achieve and maintain healthy cholesterol levels. They’re also an excellent source of insoluble fiber, the type that sweeps waste through your intestinal tract and promotes bowel regularity. A diet centered on high-fiber foods is thought to protect against heart disease and type-2 diabetes, according to the Harvard School of Public Health. Like lentils and dried beans, dried peas are a concentrated source of vitamins and minerals. 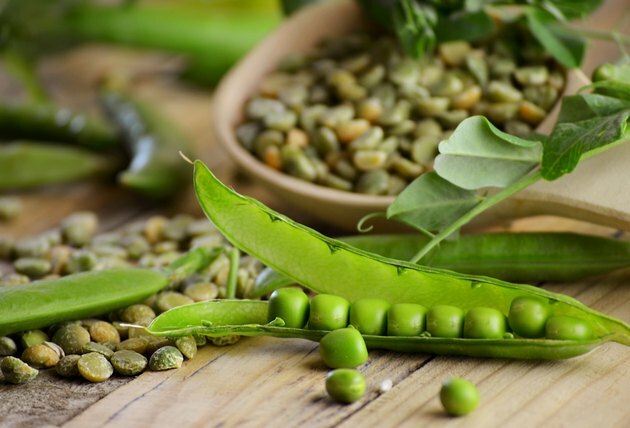 Split green peas are a good source of the B vitamins folate and thiamine, providing 16 percent and 12 percent of the recommended daily values, respectively, per 1/2-cup serving. It also supplies 10 percent each of the daily values for potassium and phosphorus, as well as 7 percent each of the daily values for zinc and iron. Although the iron in dried peas and other plant-based foods isn’t as readily absorbed as the type found in meat and other animal tissues, you can boost its absorption rate by eating the vegetable with a food that’s high in vitamin C, such as broccoli or bell peppers. The American Institute for Cancer Research calls dried peas and other mature legumes cancer-fighting foods. Not only are they high in fiber and folate, but they also contain various potent antioxidant compounds, including sterols and flavonoids. In general, whole dried green peas are nutritionally comparable to the split variety. Whole peas are slightly higher in fiber, however, according to the book “Wellness Foods A to Z: An Indispensable Guide for Health-Conscious Food Lovers.” While both types taste the same and can be used interchangeably, split green peas are much faster-cooking than the whole variety. Make split pea soup a cold-weather staple – you’ll boost your fiber intake while satisfying your urge for comfort food.